While Marvel always puts out numerous trades to coincide with their films, the media push for Guardians of the Galaxy was different. The film covers so much ground in Marvel’s cosmic stories and the modern incarnation has existed for such a short period of time that they had to republish just about everything from the 1970s to War of Kings. 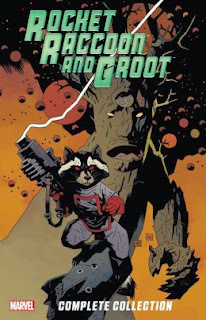 Anticipating a rising interest in Rocket Raccoon and Groot, Marvel decided to add their back-up feature stories from the two Annihilators mini-series to the paperback version of the Rocket Raccoon: Guardian of the Keystone Quadrant hardcover. The Rocket Raccoon and Groot Complete Collection trade will likely sell more based on the name recognition than on the stories within in. They’re not bad, but they’re . . . weird. It starts with Groot’s origin from Tales to Astonish, a classic Marvel monster story by Stan and Jack. Groot is easily the most memorable part of the story due to Kirby’s design work; the human characters are just there to keep the plot moving. It’s not bad for a short story, but it’s not a classic like Fin Fang Foom’s origin from a year later. Groot would only have minor cameos until he became a core member of the Guardians forty years later. It would have been nice to include the story from The Incredible Hulk Annual #5 wherein he works with other classic monsters like Goom and Taboo ... but he’s actually a fake in that story, so I can see why it was left out. Speaking of the Hulk, Rocket Raccoon made his first appearance in issue #271, the next story collected in this volume. It’s towards the end of a long story arc in Bill Mantlo’s character-defining run which saw the Hulk transported to various planets and dimensions. Using the issue as a backdoor pilot for the Rocket Raccoon mini-series, Mantlo puts the reader and the Hulk on the same page by going right into the story and letting the context unfold. The “funny animal” genre had faded out of popularity in comics decades beforehand, and Rocket and his world were one of the first deconstructions of the idea. Later funny animal comics, like Marvel’s Spider-Ham and DC’s Captain Carrot and the Zoo Crew, would be more parodic, but the original Rocket stories are almost like Usagi Yojimbo in their tone and execution. If you’ve seen the Guardians film -- and if you haven’t, spoilers lie ahead, and go see it, it’s awesome -- you’ll remember that Rocket has no idea what a raccoon is and claims to be a unique individual. This was likely done to create some distance between the film character and his downright bizarre origins in the comics. Much of the Rocket Raccoon mini-series involves the various sentient animals of Halfworld fighting against the lizard warlord Dyvyne and the scheming mole Judson Jakes and his robotic clown assassins. As it turns out, Halfworld is a massive insane asylum. All of this is played nearly entirely straight. It’s so at odds with the rest of the Marvel cosmic landscape that it’s hard to believe that it was ever fully incorporated with Thanos, Adam Warlock and the like. Simultaneously surreal and intriguing is the artwork by Mike Mignola in one of his earliest jobs. He draws Rocket with giant, piercing eyes, closer to real raccoons but different from most depictions of him. Before the book closes out with the back-up stories, there’s an interesting black and white story from Marvel Preview by Mantlo and Keith Giffen. This was part of Sword in the Star, an unfinished space opera adapting Homer’s Odyssey into science fiction. The main character, Prince Wayfinder, encounters a sentient raccoon named “Rocky” and fights a monstrous tree. This is considered Rocket’s first unofficial appearance -- even if it’s out of order in the trade -- but it may also be the first time Rocket and Groot ever appeared together, as the tree could plausibly be that universe’s version of the tree monster. I like that they included it for the sake of completeness but I really wish they had included a preface explaining the context; I had to look up all of the previous information. Additionally, this is also the first time Rocket was ever depicted as having a British accent, a detail which has come and gone over the years but was removed for Bradley Cooper’s depiction. From there, Rocket and Groot jumps forward to collect the adventures of the title characters after the Annihilation: Conquest event. Most of the team is dead and Rocket is stuck in an office job. With help from an overly serious scanning computer, he has to rescue Groot from some of Judson Jakes’s robot clowns. This leads to a return to Halfworld and an explanation of what happened to Rocket to make him forget about his home. In a funny touch, while the clown robots predate the horror film Killer Klowns from Outer Space, artist Timothy Green II redesigned them a bit to resemble that film’s Klowns. I can’t quite recommend the Rocket Raccoon and Groot Complete Collection as the first thing to pick up if you enjoyed Guardians of the Galaxy. Both characters are pretty far removed from their origins at this point. You’d be best off picking up either the Annihilation: Conquest trades or the recently-released collections of the Abnett and Lanning run which created the modern team. After that, you’ll have enough context to enjoy this collection more and appreciate Bill Mantlo’s proto-Grant Morrisonian weirdness.